I thought I would show you how Nick and I decorated for Fall this year, before all our fall decorations go away, which will be on exactly Friday November 26th. (We love Christmas and Christmas decorating is my absolute favorite! In order to get the most time out of our Christmas decorations, while still preserving the sanctity of Thanksgiving, the day after Thanksgiving has officially become decorating day). Anyway, back to Thanksgiving/Fall before I get too carried away thinking about Christmas! This year we went with a very simple route for Fall Decor... A few pumpkins, some faux leaves and flowers, and walnuts. The most decorated space in our house is the dining room table. 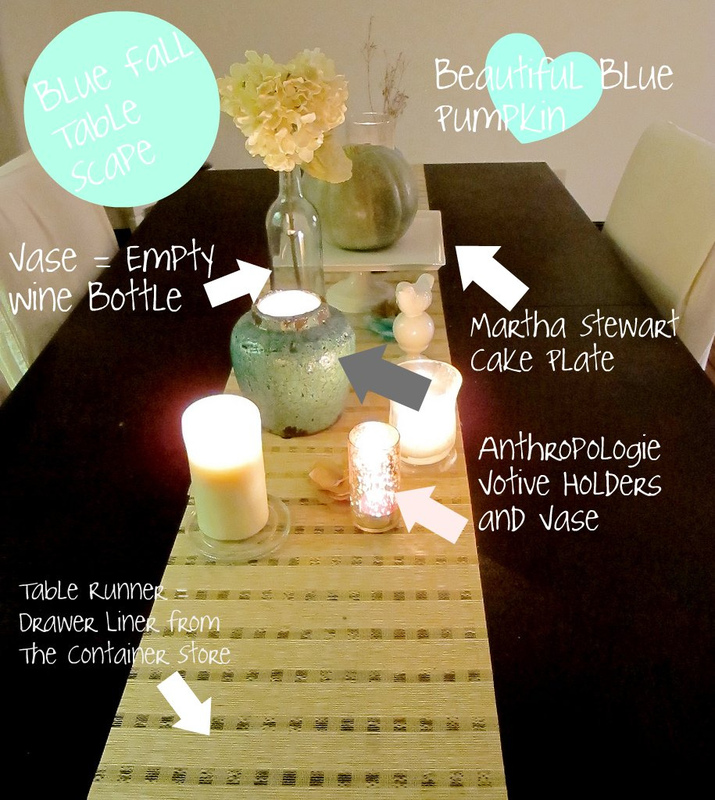 I created a table scape on this table centering around my beloved blue pumpkin. I made some turquiose and gold tissue paper flowers to add into the mix. I also used some brown rice for a filler for my candle holder (an idea from YHL). On our floating shelves in our living room, I added a woven plate from IKEA, some faux flowers in cheap-o IKEA vases, and this little reed diffuser that was a gift from a student a few years ago. Here on our stereo cabinet we have a collection of white (IKEA) frames. I like to switch our what goes in the frames, depending on the season. I've used craft paper, wrapping paper, photos, etc. For fall I found this cute fall print from Etsy, for $12 and as a bonus, the artist threw in the flower photo for free! Wohoo for free stuff! On our coffee table, I added an IKEA lantern (beginning to see a trend?) with a candle and some walnuts as a filler. I think I saw the walnut idea in a Pottery Barn catalog. Finally, I changed out the bright summery pillows on our couch, in favor of some more neutral pillows. Since we have a white couch, changing pillows is an easy way to alter the look of the living room. So there you have it... our fall decor this year. Besides the pumpkins, faux flowers, walnuts, and the Etsy print, everything else we used were things from around our house. We Nick definitely likes when my decorating is cheap. Now on to Christmas! And how did the babies celebrate Veteran's Day?